Shamanism in the Americas - ARTE AMAZONIA provides a global voice through art for the indigenous cultures of the Amazon. By Luis Eduardo Luna, Ph.D. The conquest of the Americas by the empires of Europe resulted in the nearly total loss of the cultural, technical and intellectual achievements of one third of the population of the world of that time. The Amerindian crops adopted by the European conquerors spread around the world: corn, potatoes, manioc, tomatoes, pepper, calabash, certain beans, as well as stimulants such as cacao, coca and tobacco. Yet the advanced technical capabilities of many Amerindian societies in the fields of astronomy, engineering, medicinal plants, ceramics, weaving, basketry, and – as is becoming increasingly evident -- the sophisticated and efficient use of the land, did not have any significant impact on the home countries of the conquerors. Apart from the academic work of relatively small circles of historians, ethnologists, anthropologists and the obscure accounts of travelers, there was no European acknowledgment of a single philosophical idea from the people of the Americas prior to the recently awakened interest in Amerindian shamanism. There was no technical or philosophical/theological exchange between the peoples of the two continents. Europeans viewed the Amerindian population as objects of conversion, assimilation, subjugation or annihilation. The sacred books of the Maya were burned in 1562. The quipus of the Andes -- a work of the Devil according to sixteenth century friars – were destroyed by a decree in 1583. The sacred groves, temples and places of worship of the Amerindians were desecrated. Revered works of art were melted down for the price of their gold. The repository of Amerindian traditions, the bearers of wisdom who “remembered” and knew “how to speak”, were hunted and killed. Their knowledge was treated as the work of Satan, still today a powerful archetypical figure in both the Christian and Islamic worlds. It was the obliteration of the wonderings about the nature of reality of a whole continent with the transplantation into the Americas of an Indo-European syndrome that, according to Gimbutas (1989), had already destroyed the spiritual manifestations of European Neolithic cultures, the “Old Europe”, largely associated with the natural environment. At the time of the arrival of the European conquerors, the “Old World” for a long time had been engulfed in ideological religious wars in which deviation from pronounced dogmas could be punished with death. All of this went hand in hand with deforestation, a development that in the West goes back to Greco-Roman times, if not even further back in time to the fear of forests: it can be traced to the Mesopotamian myth of Gilgamesh, the first hero in world literature, who embarked on a quest to kill Humbaba, the demon of the forest, who lived in the mountainside cedar groves harvested to the last by the ancient Sumerians (Harrison 1992). The deforestation of Europe was carried out in the interests of agriculture, the conversion to grasslands for the grazing horses, cattle, sheep, goats and pigs to satisfy an insatiable appetite for meat and milk, the construction of houses, palaces, fortresses, boats and weapons, and for strategic or religious reasons. The Americas are still being subjected to the kind of devastating deforestation that already by the time of the conquest of America had decimated the forests of much of Europe, North Africa and the Middle East. Domesticated plants and animals from Eurasia accompanied the conquest of the Americas, destroying much of the original biota, a phenomenon referred to by Crosby (1986) as “ecological imperialism”. At the same time the indigenous population was condemned to humiliation, subjugation and poverty, barely surviving history’s greatest ethnocide. Almost by a miracle after five hundred years of persecution, one aspect of Amerindian cosmology did survive, although in an attenuated form: shamanism. The term “shamanism” is used here to refer to an innate human capacity, culturally manifested in various ways, which include several universal elements: altered states of consciousness (ASC), community rituals, spirit world interaction and healing (Winkelman 1992, 2010). The ASC produce a cognitive and personal transformation by means of various techniques used to enter into an “integrative mode of consciousness” (Winkelman 1996, 2010), which include sensory overload or sensory deprivation, drumming, chanting, fasting, isolation, meditation, and hyperventilation. Both in the past as well as in the present numerous examples can be found of the use of psychotropic plants, often in combination with one or more of the other techniques. The cognitive changes thus achieved may involve journeying to complex, stratified and interconnected worlds perceived as ontologically real, and contacting entities often related to the natural environment, such as animal spirits, or the spirits of the dead. These changes may involve a symbolic death, or experiencing a transformation into an animal such as a bird or a powerful predator to visit specific realms or to better perform a certain task. Understood in this sense, shamanism entails a socially recognized status that includes the possibility of certain individuals being able to heal, cause harms, prophesize, mediate in situations of social conflict or obtain leadership capacities by means of the knowledge and power acquired by such techniques and supernatural contacts. Shamanism was of central importance in the Americas prior to the arrival of the Europeans, and still plays a central role among contemporary indigenous groups as well as among certain segments of the mestizo population. Its ethnography has been extensively and widely documented. When examined from the perspectives of the shamanic paradigm, much of the art left behind by pre-Columbian societies, as well as specific paraphernalia, point in this direction. The archeological record suggests that shamanism may have often been intimately associated with the use of certain plants, usually considered as sacred, and as proposed by Winkelman, now known as psychointegrator plants. Winkelman (1996, 2010) uses the concept of psychointegrator plants and the related concept of integrative modes of consciousness to postulate that they reflect not only what happens at the level of the self, but also at the biological level, manifested in theta wave synchronization, i.e., at 3-6 cycles per second. The Winkelman model posits an accessing of information from the lower levels of the brain, the brain stem or reptilian brain that regulates vegetative processes such as breathing, heartbeat, and the fight or flight mechanism as well as accessing the paleomammalian brain or limbic system that supports functions such as emotion, behavior, long-term memory and olfaction. Winkelman suggests that in this way the information that is normally habituated or relegated to the subconscious is made available through a reverse inhibitory process. In addition Winkelman posits that at the physiological level psychointegrator plants and substances enhance the way the serotonin system functions, modulating and integrating information within the brain. They also inhibit very specific mechanisms, releasing certain dopamine-related capacities of the brain normally repressed by serotonin, and consequently enhancing the functioning of the dopaminergic system, which is fundamental to motivational and learning processes of the brain. Winkelman uses the concept of psychointegrator plants to refer to experiential, phenomenological or psychological aspects of their physiological effects. He suggests that the resulting mentation (how you think) and emotion (how you feel) may produce a holistic state of psychological integration and emotional growth. Some of the alkaloids found in psychointegrator plants are surprisingly similar to human brain neurotransmitters, reflecting adaptions made by human ancestors in the course of evolutionary processes. Psychointegrator plants are traditionally used across cultures in a religious, spiritual and often therapeutic context, and may enhance some of the innate capacities of consciousness, integrating various forms of information. They seem to enhance the innate capacities of human beings for spiritual experiences, as well as the presentiment of spirits embodied in nature. The standard Eurocentric worldview has no place for the powerful cognitive transformation facilitated by psychointegrators. For this reason the typical inhabitant of a Eurocentric worldview is unable to make any sense of examples of Amerindian art such as the extraordinary Tolita ceramic from Ecuador shown in Fig 1 (Klein & Cruz 2007). In Europe, prior to the advent of modern art, there were few representations of the cognitive changes such as of body perception, of the disintegration of the self, or of the perception of non-natural entities that may be produced by psychointegrators. But once shamanism and integrative states of consciousness are taken into account, a great deal of Amerindian art begins to make sense. A case in point is the pioneering work of the “Father of Colombian Anthropology” Gerardo Reichel-Dolmatoff and his study of the pre-Columbian gold work in the Gold Museum in Bogotá (1988). He argues that by recognizing the relationship between ritual objects and the subjacent shamanic ideology a deeper significance is revealed. In fact the greater part of the figurative representations constitute a consistent and articulated complex of shamanic art, with transformation as the unifying theme (Reichel-Dolmatoff 1988). He contends that much of the artwork preserved can be explained in terms of the shamanic paradigm. Certain iconographic elements may serve to identify particular figures as shamans, such as special headdresses, specific postures, rattles, and more significant representations of animal transformation or journeys by means of animal auxiliaries. The ritual objects include several golden snuff trays from the territory of the Muisca people in the central highlands of present-day Colombia. The snuff trays, decorated with felines and birds commonly associated with shamanism, were once used for the storage of small amounts of the highly psychoactive powder obtained from the crushed roasted seeds of Anadenanthera peregrina. The ritual objects also include golden poporos once used for the storage of small amounts of lime as well as poporo sticks once used in the consumption of coca – the poporo sticks are topped with tiny and complex heads with apparent shamanic motifs. 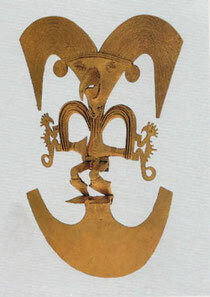 Representations of birds or winged objects are also predominant in the goldwork. Reichel-Dolmatoff suggests that the winged motif is connected with the shamanic sphere and is a conscious or unconscious allusion to shamanic flight. In many instances he recognizes, in different styles and variations, the figures as that of a shaman transformed into a bird, a “bird-man” (two examples from Reichel-Dolmatoff 1988). There are also highly abstract examples of goldwork, which are variations of the birdman motif, once the basic elements are recognized. Effigies of various animals, sometimes of a fantastic, non-naturalistic nature, some times accompany the central figure, which the author interprets as animal auxiliaries perhaps representing qualities such as sharpness of sight or hearing, aggressiveness, the ability to undergo metamorphosis, etc. The incorporation of animal qualities –in its more radical form complete transformation into an animal- or the transference of those qualities to their patients being one of the characteristics of shamans in many cultures (Luna 1992). Reichel-Dolmatoff also presents examples of golden figurines with a toad spread on the head of the central figure, perhaps a reference to Bufo marinus, whose parotid glands produce bufotenine, a psychoactive alkaloid, as well as figurines in which semi-spherical bodies appear on the head, possibly a reference to psychoactive mushrooms according to Schultes and Bright (1979). In some of these figures both elements appear. The goldwork preserved at the Museo del Oro is thus for Reichel-Dolmatoff “a treasure of shamanic art, a treasure of forms and ideas which for thousands of years have constituted one of the cornerstones of the Indian cultures of this country”, and the Bird-Man, the ecstatic shaman, one of its key symbols. 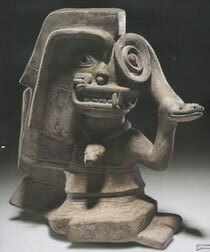 Rebecca R. Stone in The Jaguar Within: Shamanic Trance in Ancient Central and South American Art (2011) examines what she calls “shamanic embodiment”, which may be artistically expressed along a continuum that may go from predominantly human to creative mixtures embedding animal selves to images almost wholly given over to the ineffable. She argues that in order to represent a shaman, a liminal being who is both Here and Not-Here, there is a deliberate engagement with ambiguity, perhaps the essential feature of shamanism, which “productively fires the artistic imagination, catalyzing inventive ways to express the ineffable cosmic flux”, and using such strategies as “juxtaposition, conflation, substitution of parts, pars pro toto (the part stands for the whole), inversion, double reading through contour rivalry, figure-ground reversal, and three-dimensional versus two-dimensional aspects), mirror-imaging, abstraction, and interiority.” (Stone 2011:67). Among the myriad possible artistic approaches to the paradoxes intrinsic to embodying of the shamanic Self, she proposes four general traits: creative ambiguity, authority, cephalocentrism and the trance gaze. By way of evidence, she cites examples of Ancient Costa Rican and Central Andean Art, at the same time pointing to the possibility of subjecting thousands of works of art from all over Central and South America to a similar analysis making use of the concepts she has presented. Rebecca Stone’s compelling and encompassing well-crafted argumentation is impossible to encapsulate in a few paragraphs. Here are some ideas I found particularly attractive. How can the artist through colors, shapes, and lines in a static image capture the flux of liminality, of existing somewhere suspended between states of being, of true multiplicity in the Self? Amerindian art gives a plethora of solutions. The artists, without the constraints of an artistic mandate to reproduce terrestrial appearances, have as their goal the recorporealization of the shaman, something that entails a decorporalization, just as does the visionary experience, and then the rebuilding of a different idea of a spirit-body as a holder for the being in trance. The visionary experience, on the other hand, requires a participation in a convincingly nonhuman-centered gestalt of all nature infused with life and obviates the need to make hard-edged visual distinctions between a person and a bat or a peanut and a divine being. The artist is able to throw aside discrete categories and mimetic attachments to this world and its static constituents by exploring possibilities beyond how things look under normal conditions, creating combinations that defy description. The Western worldview limits our understanding of such art objects because seemingly neutral terms such as “image,” “depiction,” and “representation” inevitably communicate the opposite of the shamanic approach to the object. Amerindian artists on the other hand “embrace creative ambiguity”. Rebecca R. Stone proposes that the object we call an effigy of a shaman served as both a visual rendition of the shaman’s many selves and as one of the shaman’s subjective selves. We may infer that seen as a whole, totally unrecognized by most people, Pre-Columbian art is full of allusions to unseen realms, shamanic transformation, subjective states and alternative modes of cognition. One of the most common themes is the jaguar transformation. The human / feline motif is found in South America from the earliest cultures, such as in Caral (ca. 4,600 B.P.) in Coastal Peru. The idea that shamans are able to transform into jaguars is widespread even today in the Amazon, as shown by Reichel-Dolmatoff (1975) in his monograph on this subject. Transformation into other animals, such as serpent, harpy eagle or whatever animal it would be necessary to acquire certain qualities or cognitive abilities is also believed to be possible. Therianthropes, a composite of human and animal, sometimes of several of them, as well as many other motifs expressing various inner states are thus common in Amerindian iconography. Therianthropes may be either a representation of entities acquiring anthropomorphic features in order to communicate with human counterparts, or an expression of a subjective perceptional mode in which the human acquires animal qualities. These images would instantly evoke in Amerindian people particular cognitive states related to multidimensional, multilayered cosmologies, spaces in the mind (perhaps the perception of alternate realities) nowadays mostly forgotten but once visited by the ancestors of all of us, as may be deduced from numerous examples of Paleolithic rock art (Clottes & Lewis-Williams 1998; Lewis-Williams 2002; Hancock 2005).